Follow properly timed lawn watering. There are a number of things you can do around your home or business to increase water efficiency and decrease unnecessary waste. Water your lawn and landscape only when it is actually needed, such as when footprints are left when you walk across the grass. Apply moderate amounts of water to create a healthy, drought- and stress-tolerant lawn. For most Florida soils, applying no more than three-quarters of an inch of water per application is enough to revitalize the grass. Install sprinklers that are the most water efficient for each use. Rotors and spray heads are good for turf areas, but don’t use both in the same zone. Use micro-irrigation (drip and soaker hoses) in planting beds. Use spray heads designed for planting beds. 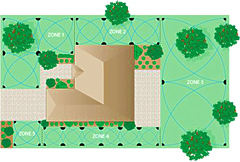 Position the sprinkler so that you water only the lawn and shrubs, not paved areas. Maintain your irrigation system. Watch for broken or misdirected sprinklers. Check for leaks and clogged spray heads. Learn how to operate your irrigation system. Check timing devices regularly to make sure they are operating properly. Turn off the irrigation system when it has rained. Fertilize only when specific nutrient deficiency symptoms are evident. Apply fertilizers sparingly and follow the manufacturer’s directions on the bag, in terms of the amount per application. Fertilize only during the growing season, which can vary depending on where you live in Florida. Use pesticides, herbicides and fungicides only when needed, and apply them responsibly, following the label’s directions. Cut your grass at the highest recommended height for your turf species or the highest setting on your lawn mower. Cut no more than one-third of the grass length at one time to encourage grass roots to grow deeper. Fix leaky toilets, faucets and pipes. Run the dishwasher only when you have a full load. Set clothes washing machines that have variable settings for water volume at the minimum amount required per load. If load size cannot be set, operate the washer with full loads only. Avoid flushing the toilet unnecessarily. Dispose of tissues, insects and other such waste in a trash can rather than in the toilet. Install faucet aerators (circular screened disks, usually made of metal, that are screwed onto the head of the faucet to reduce flow).